With the Cine Latino Film Festival to start very soon, we’ve been scouring the program and watching all the trailers for this great new cinema event. 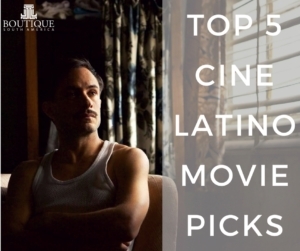 With 34 films from 11 different Latin American countries, it hasn’t been easy to narrow down our top movie picks but these are the movies we are most looking forward to watching this year. We love the man’s poetry and know what a significant role Pablo Neruda played in Chilean history and culture. This new take on his story, set at a time when the enigmatic, controversial and gifted figure was being hunted for his role as an influential communist figure looks very entertaining. Oh, and the casting of Gael Garcia Bernal (from the Motorcyle Diaries) as the police officer searching for Neruda is sure not to disappoint. Whilst set in the Peruvian amazon, the landscapes and where this group of 4 film makers does not appear to be the crux of Lombardi’s film, Solos. This account seems to focus on the essence of the journey, what we learn about ourselves and others when we travel and grow. And those are concepts that as film lovers and travellers we can definitely relate to. If you’ve ever seen the look on a Brazilian’s face when you mention the word ‘Maracanazo’ you will understand that football isn’t just a passion in Latin America, it is life. And this documentary based on the most famous match in the history of Brazil and Uruguay, the World Cup final of 1950 looks absolutely fascinating. The original Portuguese title for this film translates to ‘Everything we learn together’ or ‘Heliopolis’ after the name of the slum in Sao Paulo the film takes place in. Two very different lives, that of Laerte a prodigious violinist and the gifted student Samuel he finds in the unlikeliest of places seem to intertwine magically in this tale about the power of music and connection. There have been some great comedies to come out of Argentina throughout the years, and How to Win Enemies looks to be another. The unassuming Lucas who loves detective stories becomes the centre of his own when a one night stand results in the theft of the cash deposit for his apartment. The Cine Latino Film Festival screens nationally in Palace Cinemas from the 9th of August. Check out the festival guide here. Boutique South America is proud to sponsor the event and will attend the opening nights in Sydney and Melbourne.